The Top Out Hoody and Oblique Pants are part of Rab’s new line of climbing/casual wear. Both pieces are available in a variety of colours and are marketed for climbing use both indoors and outdoors. 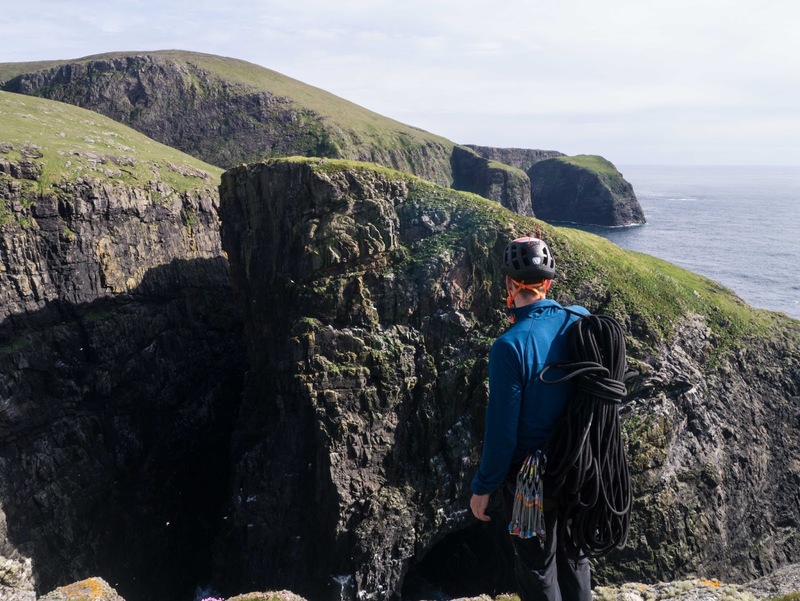 We tested the pieces at the limits of what can be classed as casual outdoor use on a recent trip to the Outer Hebrides by using them on some exposed sea cliffs. On the whole, we were impressed with their performance, the clothing allowed us to climb unhindered all whilst keeping us in the right balance of cool and warm and surviving the occasional rain shower (quick drying). The Top Out Hoody is a lightweight hoody, more akin to a heavyweight base layer (it could be used as one) than a warm layer. It is made using a propriety drirelease® fabric which is a mix of natural fibres and synthetic fibres. The material performed very well in the conditions we tested it. It saw sun, rain, wind and 9 days without a wash with daily active use. The material dries quickly and did not seem to suffer from smells which is ideal for a layer such as this. The cut is nice and close fitting with the elasticity of the fabric ensuring good movement. Note that there is a light variation in the women's version of the hoody with a full-length zip rather than the men's chest zip. The colours available for the Top Out are larger than those for the Oblique Pant and are generally more muted. The hoody also has a few additional features we thoroughly enjoyed such as a neat hood which easily fits under a helmet, thumb loops and a very effective chin guard when the hoody is fully zipped up. Overall we were big fans of this top as an active top, even more so when we discovered that it looks smart enough to be worn as a casual top. Things we like: Good neat fit, colours available, material used. Things we don’t like: None.